Since the beginning of time, we have had to balance ‘bling’ with performance. 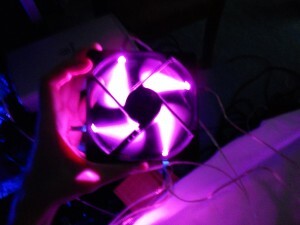 Its interesting to note that there are few, if any, 120×38 mm fans on the market that have LEDs in them. People regularly come through the cooling section asking for fans that match a certain color scheme, willing to sacrifice performance to meet that color scheme. This isn’t ideal: you’ve spent hundreds of dollars on your gear, there’s no reason it should perform at anything less than its best solely to look good. On the other hand, you’ve also got a case with a window in it and you really want that hardware you’ve spent all that time and money on to look good! This article details a rather simple mod you can do to run those high performance fans in any color you want. 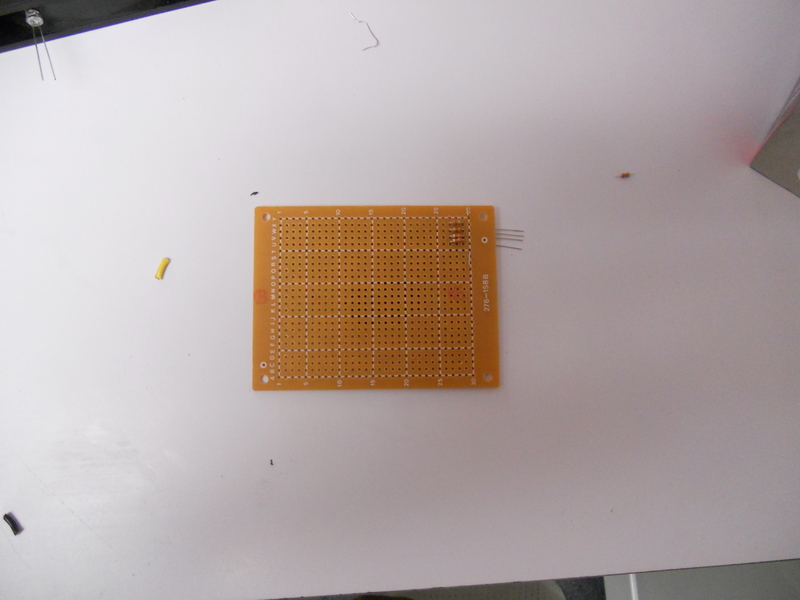 1/8 W resistors which are hard to work with because of their size. Fewer LEDs so that they take up less space. Mounting each board to the fan it’s associated with so they’re very out of the way (this method might also involve 1/8 W resistors). Power them from a 4 pin molex connector. Power them from the fan’s power leads if you’re daring and want to strip them in the middle (this method is better if you plan on mounting the circuitry on the fan). 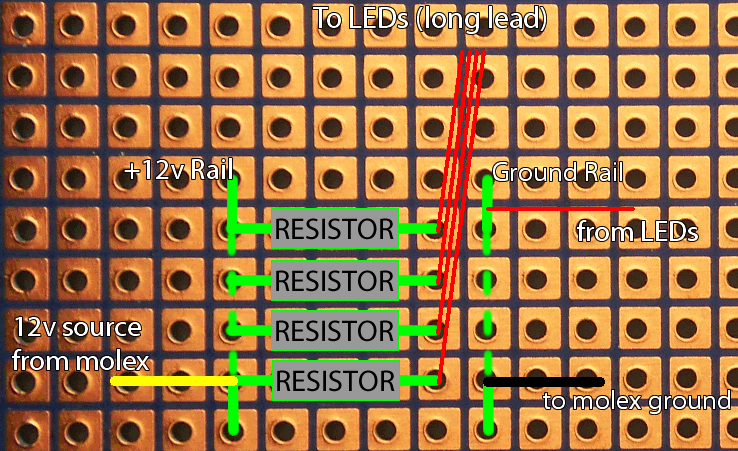 You need to pick your LEDs before you can pick your resistors. 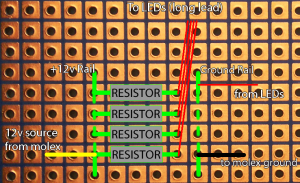 If you’re using multiple colors you may need different values of resistors. Different LEDs also light up differently, smaller LEDs will not light up the fan as well but will fit the profile of your fan better (the ones I used stick out, which isn’t an issue in the configuration it’s going into, but if you don’t have clearance for a couple mm to stick out you will need to use smaller LEDs or mount them close to the corners). 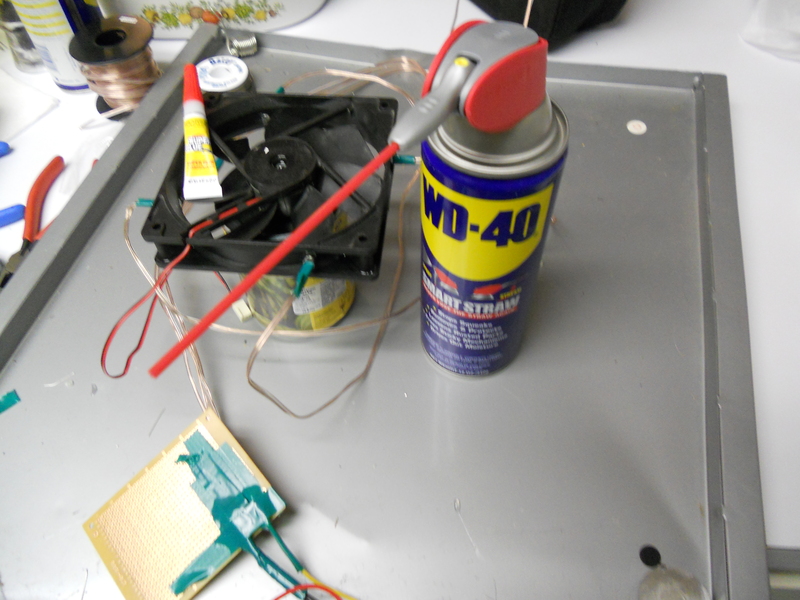 Lastly, you may want to have a couple of glues on hand, when I did this I tried hot glue and plastic to plastic cement (which may or may not have fully cured) and neither would bond to the fan casing well enough to hold the LED in its hole. I don’t know how much of this was due to the LED material and how much was due to the casing material. 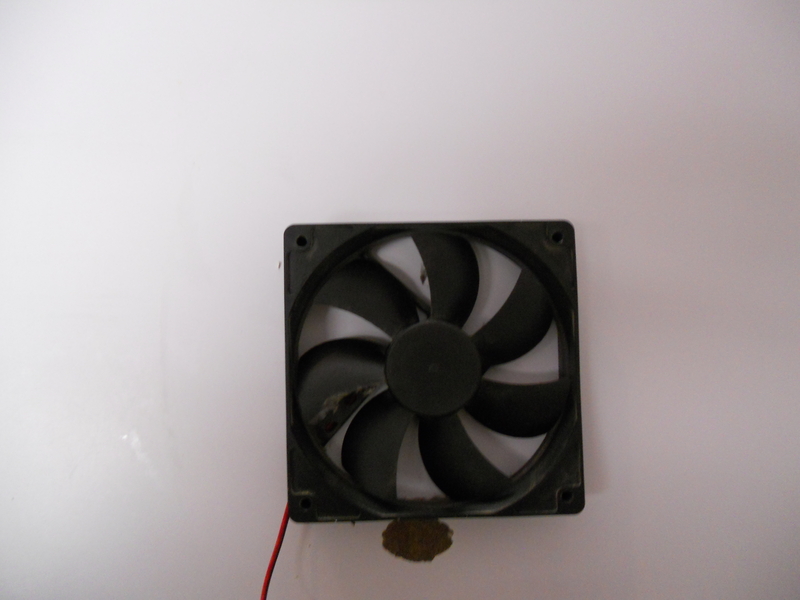 This is the 120mm fan I chose to mod, it’s in pretty good condition (if a little neglected) and seems to run fine. I decided to use 4 LEDs for this mod because I wanted fairly even coverage with easy spacing. Fans with thicker casing will work better with this mod because thicker casing allows for bigger and brighter LEDs. That said, a thin casing is quite easy to work around so any fan will work, I only include these recommendations for people doing this for a custom LED color who are not DIY inclined. Here’s another shot of the fan just so you know what I’m working with. You should get a value less than 1000 Ω. If you’re using different colors or types of LEDs, you may need different resistor values for each color or type of LED you use, so make sure that you check that. The number you come up with will almost certainly not be a standard resistor value, so pick the next value up from what you calculate. I calculated that mine, for example, required around 290 Ω. The next step up from that was 300 Ω, but RadioShack didn’t have that in a 1/8 W, so I got 330 Ω resistors. While you’re out getting these, don’t forget to grab some perf. 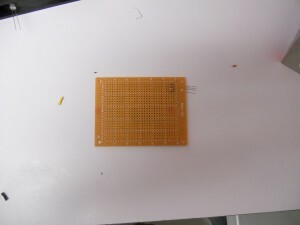 board and a male molex connector. Alternatively, you can get something with a male molex on it. I used a male molex to SATA power adapter and just cut the SATA power adapter off of it because it was only $0.60 more than a male molex connector at Radioshack and it saved me having to crimp on the connector myself. This part is a little tricky and took a third hand to get done. Remove the sticker on the hub with the fan info on it (don’t rip it, you’ll be putting it back at the end). Once that is off, remove the plug covering the hole – this step may be unnecessary as in my case the plug came off with the sticker. The next step is the tricky one: you have to remove the little ring that is inside the hole, mine was white and that seems to be the common color, but it’ll probably look yellowish because of the grease. The trick to getting this ring off is the small split in it, you may not be able to see it at first though. The way I removed this involved using two knives, I slid one knife between the ring and the wall, which bent one end of the split (try a couple of places on the ring, it took me a few tries to find one that got good separation). I put the other knife in there to hold it up then freed the ring with the other knife. Don’t worry about bending up the ring, I got the two ends of the split pretty far apart from each other and was able to just bend it back to where it was once it was out. Once the ring is off, the blades should separate easily from the motor and casing. When drilling the holes in the fan casing, you need to use a properly sized drill bit. The LED should fit snugly so that when you glue it you can just put it in and hold it at the angle you want and not have to worry about spacing or anything. The following is how you should measure the bit for your LED. That bit is actually a bit too small. I went up one size from that, but I did drill my first hole with that bit to see if it would fit. 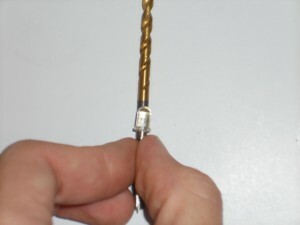 If you have two that seem to straddle the size you need, go with the smaller one and then wiggle the bit around so that it drills a hole slightly wider than the bit: it’s incredibly easy to use this method for the casing. Before you drill the hole, mark the casing with some tape or a silver sharpie where you want your LEDs to go. Make sure that you center these relative to the edges of the casing (on the 25/38 mm axis) and that you space them evenly around the edge. The hole should face so that it goes mid way between the edge of the hub and the beginning of the casing and be angled so that it is shining onto the concave side of the blades, allowing the blades to spin towards the light. This orientation gives the light the longest distance to shine so you get the most illumination possible from the fewest number of LEDs. Punch the holes before you drill them if you’re not using a drill-press. You can do this rather easily by just starting the hole going directly towards the hub. Make sure you don’t go in very deep when doing this, rule of thumb for me was that I didn’t let it go in enough that it reached the full size part of the bit, it was all of two or three turns of the bit. Once you’ve got it punched, restart the hole (as in, take the drill out of the tiny one you started and put it back down) oriented the way I mentioned earlier, toward concave side and between hub and casing. Once you have your first one drilled, put an LED into it to make sure it fits. If the angle is wrong you can adjust, just seat the LED correctly when you glue it in later. Repeat this for the rest of your holes, make sure you check the orientation on the LED for each hole. When you finish it should look something like this. If you have no soldering experience this part is going to be the trickiest part for you. I would recommend spacing your channels out more than I did mine (for reference, each LED and its resistor is its own channel). For reference, my circuit took up 24 holes total (5 per channel), so if space is an issue, the design I used should be a good reference. The order you do these things in is pretty nominal, so for those of you more experienced in electronics, here’s a not-so-schematic. For those of you who are less electronically inclined I’m going to go through, step by step, what I did. I was battling furiously with my soldering iron not heating up and overheating for this process, so I only got one picture of the board before I started soldering and then a couple after I was done, you can reference the not-so-schematic if you are confused. If your perf. board has copper pads this side is the bottom of the perf. board; if it doesn’t, either side can be the bottom. 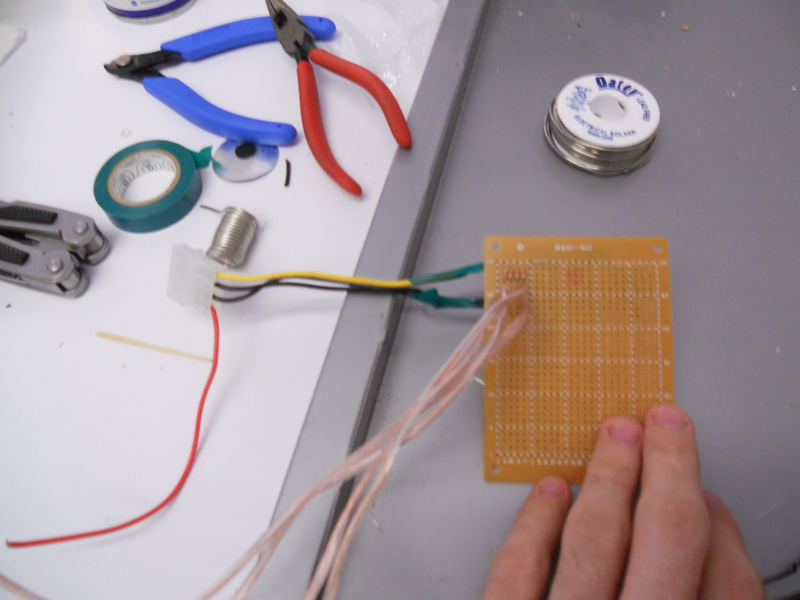 The first thing I did was put the resistors through the board and fold their leads out (like a backwards staple). After this, I cut the leads off my extra resistor (you can use any bare wire, I just had no need for the extra resistor, so I scrapped it), one of them became the rail of my +12 v rail and the other became the ground rail. Run this along the under side of the board, underneath the resistor leads and then back to the top side of the perf board, once again, it’ll look like a backwards staple. Make sure the resistors are flush against the board and solder each resistor onto this wire, double-check that the resistors are flush against the board, and then clip the extra wire off the resistors. Now it’s time to connect the molex to the board. 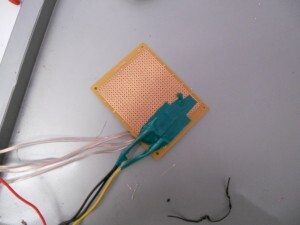 If you used a bare connector, crimp in wires so that when looking at the back of the connector (where the wires come out) with the angled corners at the top, the yellow wire is on the left and the middle two are the black wires (if you’re running it on 5 v, then put a red wire on the far right). The yellow wire carries +12 v, the middle two black wires are ground, and the red one carries +5 v. Strip the end of the yellow wire, twist the end up, tin it (coat the braid in solder), and place it on top of the +12 v rail so that no exposed wire hangs over the board. Solder this to the +12 v rail and clip any extra wire. Get the wire you will be connecting to the LEDs and cut it to your desired size. I wasn’t sure how much I’d need so I used about 3 ft on each one, but retrospectively, you shouldn’t need more than the length of your power connector if you run it off the same molex as your fan. Your wire choice can help keep things organized. The best thing to use would be long ribbon cable, but those are hard to come by so I used speaker wire which is widely available. You could use lone wires quite easily and just bundle them with electrical tape or sleeving, it all depends on what you have and what you need for your project. One point to note with speaker wire is that you need to make sure that one wire is marked because you have to connect the wire to the correct lead of the LED. Strip the ends of your wires. If your wires are braided, twist the end of the wire and tin it; if they’re not braided, just tin them and be aware that solid center conductors are more likely to break if you bend them a lot. Put your tinned wire through the perf. board on the side of the resistor opposite the +12 v rail. Push the wire all the way through then wrap the resistor lead tightly around the base of the wire to the LED once, then solder it and clip the excess. Repeat this for all your channels. If you are using speaker wire that has different colored sides, it will make it easier later if the same color wire connects to the resistor every time. Repeat the wrap and solder and clip for each channel, make sure your channels aren’t touching here. Take the bit of wire you set aside for your other rail and put it through your board one hole lower than the last hole you used (leave a row of holes open for the wire to return from the LED, if you’re not sure what this means, refer back to the not-so-schematic) and run it along the back of the board. Run the wires that will come from your LEDs through the board in the hole you left open. Solder these to the new rail like you did with the resistors on the +12 v rail and clip the excess wire. Now take your two black grounf wires from the molex (the middle two wires), strip the ends, twist each end individually and then twist the two together and tin them. Place this wire on top of the soon-to-be-ground rail so that the insulation of the wire is right up against the edge of the rail and solder it here. Clip any excess wire. I recommend that you insulate the perf board, especially if you plan on mounting it. I did it really simply with some electrical tape. LEDs have polarity, meaning that they have an anode (negative) and cathode (positive). The lead coming from the resistor must connect to the cathode because it carries positive voltage. 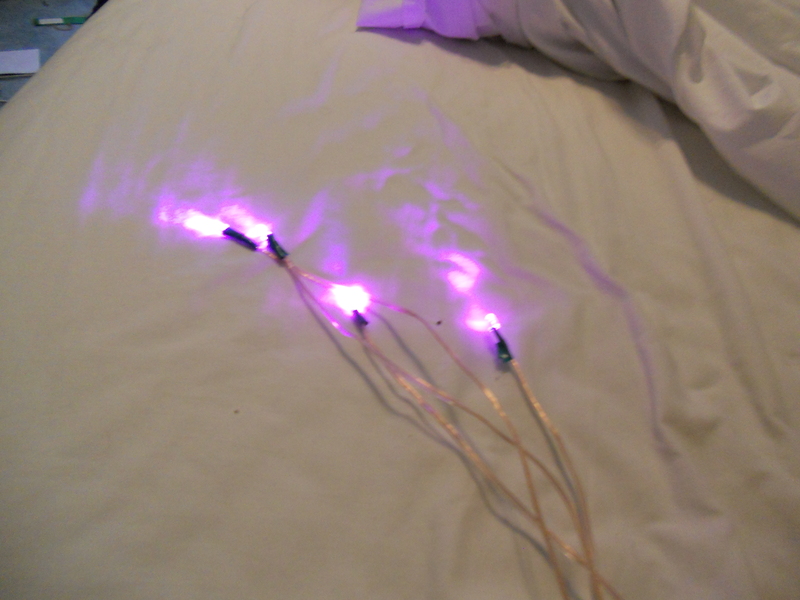 Determining anode from cathode is easy on LEDs. Typically the anode (negative side) of an LED will have a shorter lead and/or have a flat side, so the cathode will be the longer lead or unmarked side. Occasionally the LED will not be marked by the factory (this also applies if you’re reusing an LED that has been clipped already), it is still possible to determine the cathode. If you look through the LED you will see the leads come up into the plastic, one lead will come up to what looks like a flag, this lead is the cathode. Now that you know which lead is the cathode, you need to insulate part of it, I used electrical tape. 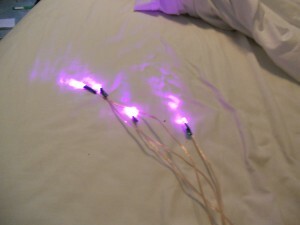 If you used speaker wire or anything else where the wires for each LED are connected together, split the wire, put the insulation of the wire up against the LED and clip the wire that will connect to the cathode so that it ends at the top of the insulation you just added. Strip the very end of each of these wires, twist them (if they’re braided), tin them, then clip the LED leads so that they’re the same length as the wire you just exposed (I typically expose 2-3 mm of wire), make sure that the anode lead is shorter than the insulation you put on the cathode lead so there is no chance of the LED shorting. This will line up the LED leads and the exposed ends of the wire. Before you solder these, double check that you get the correct wire on the cathode. Once you solder them, wrap it in a little electrical tape to insulate any exposed wiring. Repeat this for all your LEDs and you’re done. Connect the molex and turn on your computer to check it. If none of your LEDs light up, chances are you have a problem with the connection to the molex, make sure it’s wired correctly, check the connection out of the molex. Check that a multimeter reads 12 v between the +12 v rail and the ground rail. If not, your problem lies there. If it reads 12 v, then check the solder connections to the rails, if it’s not there, then there’s probably something wrong with the circuit, you may have connected all the LEDs backwards. If only one LED is out then there’s an issue with just that channel – check that you connected the right side of the LED to the +12 v rail, check that your solder joints are good, and check that you properly insulated everything and there’s no short. Before you mount your LEDs, check the spacing from your fan blades. Put the blades back in the housing (don’t put the ring on yet), push the LED into the hole how you want it to lie, and spin the blades at least one full rotation to make sure it doesn’t come in contact with the blades. You should try to have at least 1-2 mm of clearance from the bulb tip to the fan blade because the fan will get a bit off axis when it spins and this can make it hit the LED, which shouldn’t break the LED, but it’ll sound like a piece of cardboard in your spokes. Once you have it adequately positioned, glue it in place. 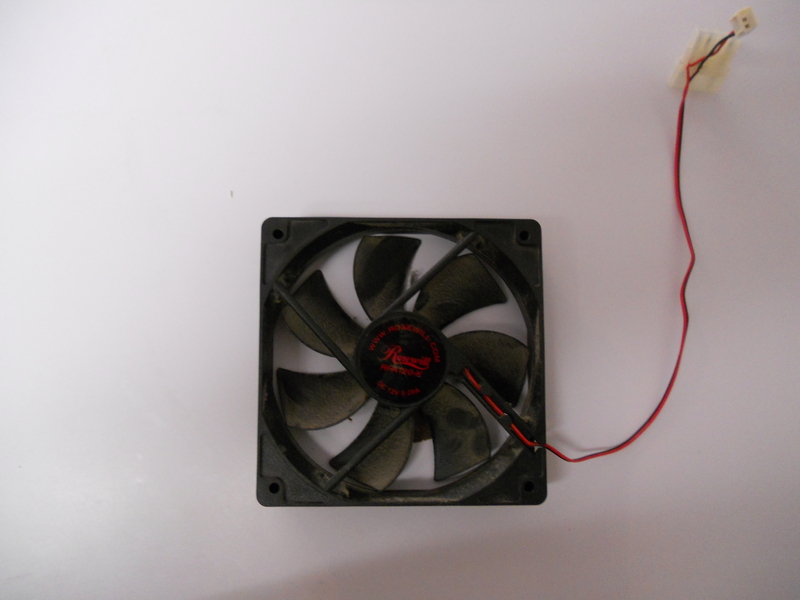 I had a hard time finding something that would bond to the LED and the casing of the fan, I tried hot glue, but that didn’t bond to the casing. I tried plastic to plastic modeling glue, but that wouldn’t bond to the LED. I ended up using superglue, which held fantastically for my casing, but it could vary depending on the material that your casing is made from. I’ve heard epoxy will work too, but I didn’t try it myself since the superglue worked. I put the glue on with a very specific method: I put the glue on the LED, all the way around it at the ridge so it would run towards the tip of the bulb, then put it in the hole. Once it was in the hole, I put some glue on the casing around the base of the LED to hold it in place. It took about 20 seconds to dry and feels like it holds really well, but I don’t know what vibration will do over time. 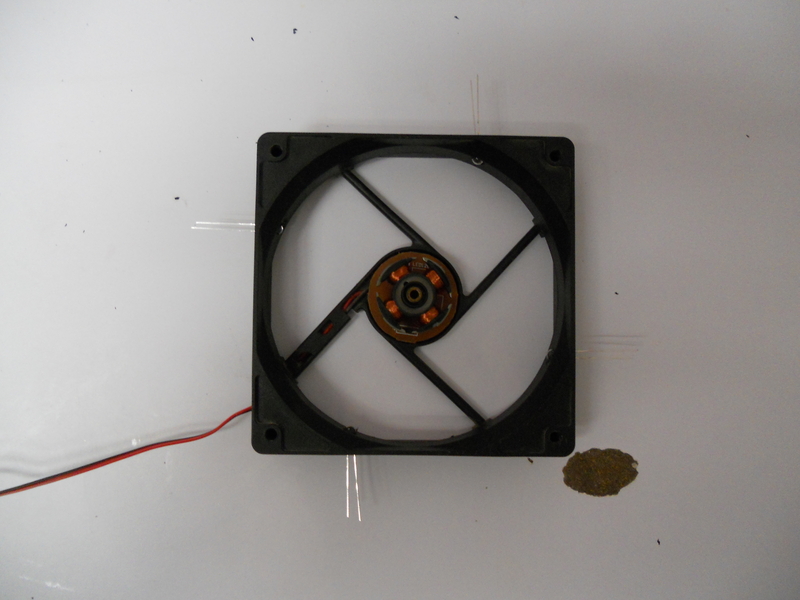 I recommend that you orient the leads so that if you drew a line along the 25/38 mm axis of the fan (the line would be parallel to the airflow) it would hit both leads. 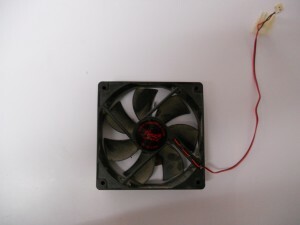 This will allow you to fold over the leads and decrease the profile of the fan after modding. Repeat this for all of your LEDs, be sure you check the fan blade clearance on each one. Put the blade in and replace the retaining ring you took out. The ring is slightly too small for the axle it goes on. I ended up just pushing it down with two knives. Make sure you push the blades all the way back and seat the retention ring as far down as you can so there is as little play as possible in the blades. Before you put the cap back on, I recommend a spray of WD-40 to lubricate the fan, you’ve got it open anyways, why not. Replace the cap and sticker and you’re done. Plug up the fan and the LEDs and see how it looks! This is how mine turned out. When I first posted this, neonblingbling recommended grinding down the LEDs to increase diffusion of the light, that should also make it flatter against the casing. Just make sure you don’t hit the electronics of the LED or it’ll have to be replaced. Give that a try if you want! Previous Article Spray Off: "Hands of the Gods"
m0r7if3r what mcd did you end up using to get that intensity? and are the one's that you used 30° to 40° viewing angle? those are the LEDs that I used...i know the stuff you asked isn't listed, but i'm pretty sure it's on the bag...alas, I have thrown them away. I'll make a trip to ratshack tonight and just check the specs. Those are pink LEDs that I used, btw, so you can probably sell your wife on them as pink LEDs and they don't look TOO emasculating. You say in the article that you should leave about 2mm clearance from the fan to the end of the led and I understand the reasoning behind this. 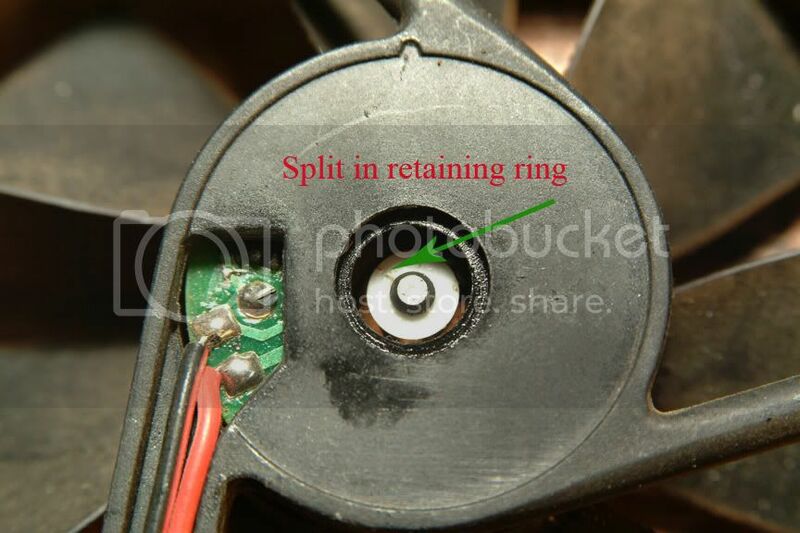 When you mounted your led's did you have much protruding through the fan casing? I looked at one of my Gentle Typhoons today that I want to do this mod on and they only have .8mm clearance from the tip of the blade to the casing edge so I would have to have the led flush with the casing in order to give clearance but I am wondering what that would do to the viewing angle pattern. I was thinking I could put a counter sink in there to barely open it up in order to retain the viewing angle if I needed to. That number was on my fan...I had figured mine was pretty close, guess not. The way I would tackle it would be grinding the LEDs (per neonblingbling's recommendation), if you're not sure about that, try test fitting it and grinding it without glueing it so you can see what it looks like...countersinking it could work, but I'm not sure how it would affect the ducting the casing naturally creates. As for how far mine stuck out, it was a good bit, but if you mount them next to the connection to the corner of the casing, it will stick out but still be covered by the casing...you could also use more smaller LEDs which wouldn't protrude much if any, my choice of LED was dictated by the fact that I already had 2 of the pink ones (got em for a guitar mod I was doing and then didn't use em in the interest of battery life), so I just finished off the set. Thanks!!! Thanks to you and the whole news team for everything! Thanks m0r7if3r, it appears that the ones you used are plenty bright. I just didn't want to end up with something out of a laser light show going off in my case. You have been great on this and I really appr. all the effort you have put into this. Hope you don't mind me adding this m0r7if3r. 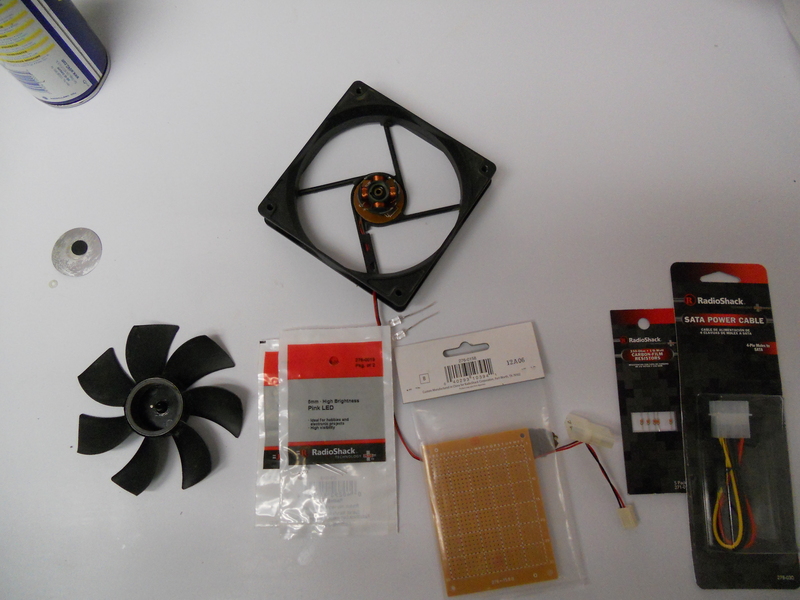 I took an old fan today to play with that I had laying around and removed the sticker using a pair of tweezer you can get at a hobby store. After removing the sticker you will see the ring that m0r7if3r is talking about (on mine it is plastic) and the split in the ring. 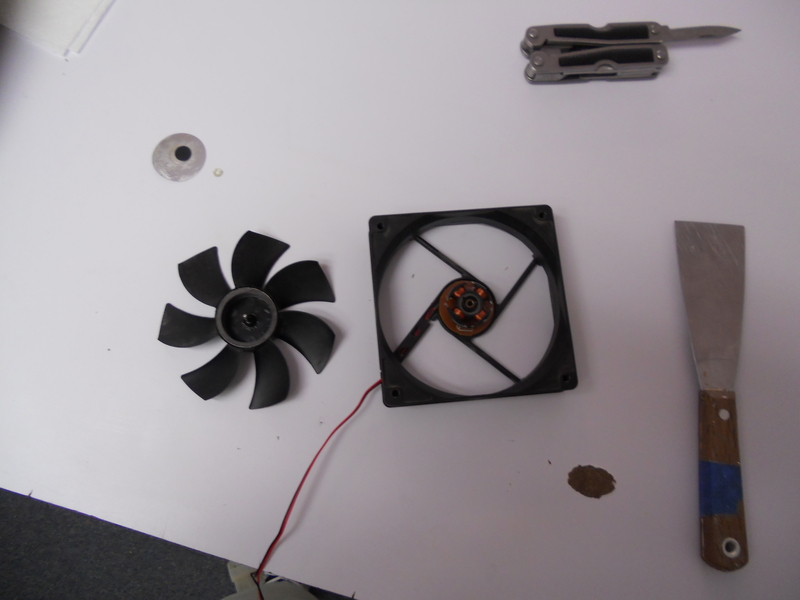 Using the tips of the tweezers I pressed down on one side of the split while holding fan blade itself with the other hand to keep the fan shaft in place, then you can get the tweezers to slide into the gap and grab one side of the retaining ring and lift the retaining ring out. 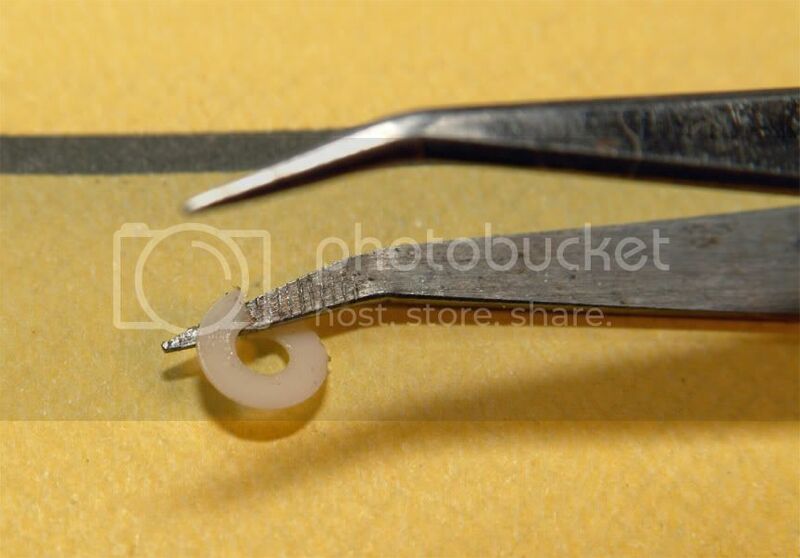 When you are ready to reinstall the ring you can use the tweezers to get it placed back on the end of the fan shaft then let the tweezers open enough to clear the fan shaft you can press down on both sides of the retaining ring to get it to go back into place. Then replace the sticker to keep dust out of the motor. :drool: that would have been SUCH a good idea...man +1 to that. I just cavemanned it out lol. I used a paint scraper to get the sticker off. To get power to the LEDs, you can also solder the wires onto the two solder pads that you can see in CgS Drone's second picture. You may already be on to what I was thinking of doing m0r7if3r, When I make mine up I will send you some shots of an idea I have. I was just thinking about adding LED's to my radiator fans when I was trying to fall asleep last night (is there a help group for thinking about modding to much??) and I gotta say m0r7if3r this is an awesome guide... will be trying this myself in a matter of days!